Powers/Abilities: Gogra is capable of building giant robots, although it appears he lacks the skill to design his own, instead stealing the plans of others. 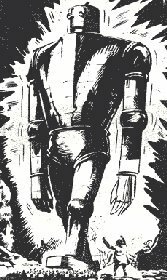 History: Gogra was an evil scientist who attempted to use the giant robot Mytek for his own criminal purposes. When his initial schemes failed, he used a variety of other robots of his own devising to create havoc, including Gorgus, a robot with his own face on it, and Tyron, a super-robot with a brain based on Mytek's. Above, a look at some of Gogra's giant robots. That would be Gorgus in the middle, but I'm not certain about which ones the other two are. 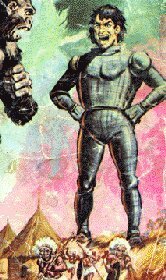 In Germany in the seventies the magazine Vulcan was published under the title "Kobra" showcasing Mytek alongside Tim Kelly, Steel Claw, The Spider and Robot Archie. 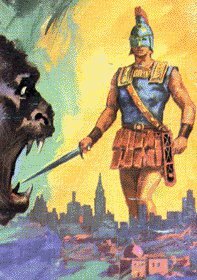 Unfortunately, the stories which were published in Kobra were partially incomplete, apparently switching stories unpredictably. Finally, the magazine was discontinued, leaving German fans hanging as to the fate of their favourite characters. Thanks to Sven Feyerabend for this intriguing information, and for the picture of Gogra used above. 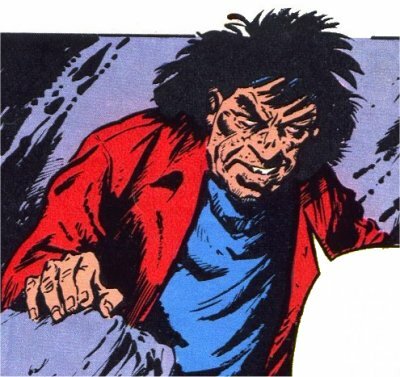 Gogra showed up as one of the inmates in the superhuman prison in Albion.